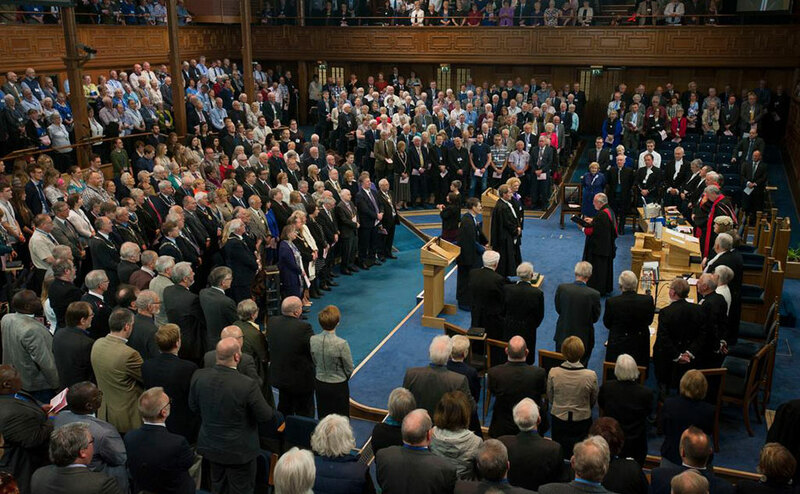 The General Assembly is the supreme court of the Church of Scotland. The Assembly meets annually to hear reports from the councils and committees, make laws and set the agenda for the national Church. The Assembly was first held in 1560, the year of the Scottish Reformation which marked the beginning of the Protestant Church of Scotland. The Assembly takes place at the Assembly Hall in Edinburgh - the previous home of the Scottish Parliament from 1999 until 2005. Learn more about our history. Many who attend or tune in online to the live worship, speeches and debates are profoundly touched by the strength and warmth of fellowship within the Kirk. Around 730 ministers, deacons and elders are commissioned to attend the Assembly each year. Delegates and visitors are also invited from partner churches around the world. A new Moderator is appointed to chair the daily business of the General Assembly each year. Moderators can be male or female and ordained ministers, deacons or elders. The Lord High Commissioner is appointed by the Queen to act as her representative and attend the Assembly as an observer. Reports provide an overview of what each council or committee has been working on over the past year, and highlights their future plans. This report is summarised verbally to the Assembly by the convener or chairperson of the council or committee, before they ask the Assembly to approve each statement (known as deliverances) in their report. Sometimes the Assembly will ask a council or committee to report back on a specific subject, or set up a committee or commission to consider an issue of importance to the Church. Reports are printed each year in what is known as the Blue Book. Each report is accompanied by one deliverance which may come in several sections. Commissioners vote to approve, amend or reject the deliverance according to personal conscience. These deliverances set the agenda and direction for each council or committee over the coming year and can change or establish new Church law. Counter-motions are brought by commissioners from the floor. They are contradictory proposals to the deliverance. As there can be more than one counter-motion to each section of the deliverance, no vote is taken on them until the whole discussion is closed and all counter-motions have been brought before the Assembly. Amendments are proposed deletions, alterations or additions which are not substantially different from the original deliverance contained in the report. This means that the original deliverance is more or less acceptable but the commissioner is proposing a comparatively minor change to 'improve' it. An addendum is a type of amendment and may be a proposed new section of the deliverance, or an addition to the end of an existing section. This is a method by which a presbytery brings a matter before the General Assembly. Once the matter has been introduced, it is debated in a similar way to the reports. Overtures are printed in the Order of Proceedings booklet. This is a mechanism by which any individual or group can bring before the Assembly a matter that affects them personally, asking the Church to take action. When their business has been introduced and questions asked of them, the petitioners take no further part in the debate, and the Assembly can dispose of the matter in any way it wishes. If you are not attending to the Assembly, you can still keep in touch with what's going on. You can connect to our webcast site to watch it live, see archived highlights, or listen to a summary of the day's proceedings.